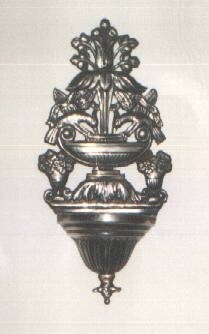 A silver holy water font with a pair of birds drinking on a fountain. The holywater font has no hallmark but, having same provenance of holy water font previously described, its origin is surely Venice. This item was, likely, of later production (mid 19th c.), having a typical 19th century appearance lacking of 18th century reminescences. 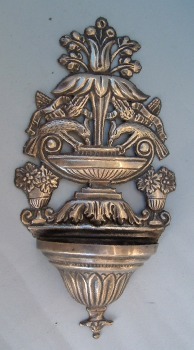 The holy water font is 7 1/2 in. (cm. 18) high and 3 3/4 in. wide (cm. 9) and belonged to my mother's family, living in Pellestrina, once a fisherman's island of Venetian Lagoon.